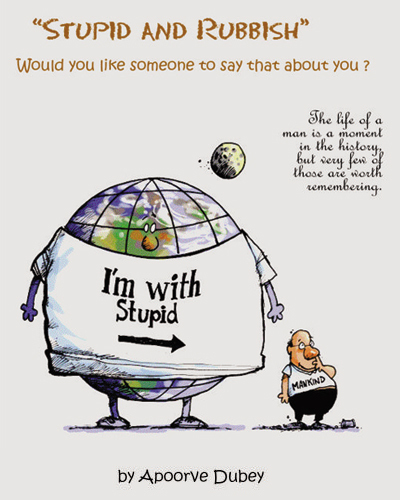 Stupid and rubbish, would you like someone to say that about you? The answer is probably not. But the fact is a lot of us spend our lives doing stupid and rubbish without ever realizing it. Life is short. It is made even shorter because of the speed at which we live our lives. We rarely get time to think and reflect about ourselves. The world existed before you were born. The world will exist even after your death. It is scary to think about it, but death is our ultimate destination. We may not realize that we are racing towards it. Have you ever thought what difference does your existence make to the world? It is a question that has always fascinated me. I believe we ought to leave behind something that outlasts us. Otherwise, what else was the need of our existence for a brief period? Life is an opportunity for us to create something that outlasts us; an indelible footprint in the sands of time by contributing something that makes the world better than before. I want to take this opportunity to thank the most important community, the readers. There is nothing more endearing than to receive the love and affection of the readers. My first book ‘The Flight of Ambition’ has been received well and has been touching the lives of people in a positive way. The book is making a contribution in their lives and that delights me. I owe this one to all those wonderful readers. Thank you for reading the book. It is my earnest wish that the ideas in this book will trigger a transformation that leads you to be the best, you can be. At the end, I leave you with a parting thought and a personal goal sheet for implementing what you have read. Each day you have to challenge yourself. You have to press hard and go that extra mile. You must learn to push your limits. You have to fight the little battles with yourself before the world can see you as a winner. You have to defeat yourself, fight with yourself. You have to say no to the little things that bring you down. You have to do the little things that make you better. This is what it takes, to be a winner. You have the power to choose who you want to be. Be the greatest, grandest and best you can be. Back yourself against all odds and live your dreams. Don’t let anything stop you from doing what you love the most. Nothing big can be achieved by thinking small. Think big and act. Execution is the key to great success. You are not what you think; ultimately you are what you do. Writing your goals is the first step to execute your ideas. It is strange but when we write down our goals, it increases chances of reaching them significantly. It may be really tough but if you fail to write your goals now, chances are you would never write them. I request you to do the following after reading this book. 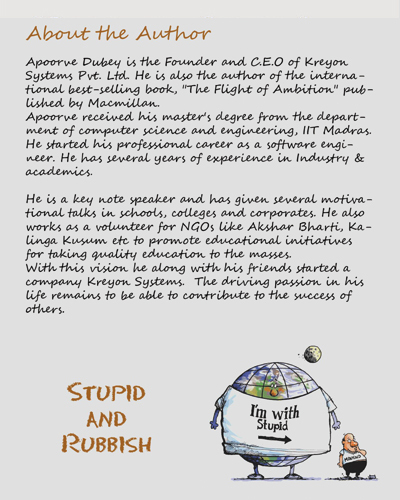 Send your Feedback to me at [email protected] You can also visit www.apoorvedubey.com to contact me. Write your goals. Please see the Appendix for the templates. Talent often gets beaten by practice. Show up. Execute your ideas. While you are on the planet work hard, enjoy and make the most of life. Wish you all the best and hope you make it really big. I would love to hear your success story. Writing goals is a powerful way of achieving them. Once you write your goals they become part of your subconscious mind. Keep these goals where you can see them daily. Soon you will draw energy from your subconscious mind to achieve your goals. Your subconscious mind keeps working on your goals day and night. You just need to feed the goals to your subconscious mind by writing them and making a practice to look at them regularly. The most effective time to program your subconscious mind is first thing in the morning and before sleeping at night. The world of nature is intriguing and interdependent that a small butterfly flapping wings in the Amazon rain forest can generate a violent storm on the other sides of the earth physicists call it "Butterfly effect". Similar is the nature of change in a human's life, even a small change can bring about a revolutionary impact in your life. You can call it "change effect"
We at Kreyon believe in spreading light, colour and creativity in the lives of people around us using technology as a medium. We work day and night to convert our dreams to reality. Whether it is our customers, employees and people around us, we believe in enhancing the world by writing world class software and providing excellent services. Kreyon Systems Pvt. Ltd. is a fast growing Software company that serves clients in more than 10 countries. Kreyon Systems has an impressive product portfolio and is focused on innovative products in the area of Enterprise software’s like CRM, Asset Management, Supply Chain Management, ERPs etc. Kreyon offers the best in class technology solutions leveraging the high end expertise in Mobile, cloud & analytics computing. Kreyon Systems provides end to end software solutions & IT consultancy to various organisations for optimisation of business processes & growth. The company is a medium to make an impact in the lives of people. We believe there is no better way of empowering people than to provide employment & generate opportunities for the youth. The aim is to create a self-sustainable model of giving back to society by creating excellent software products and services. Thanks to Anurag Kewat for designing the cover visual for the book. This guy is excellent and works superfast. All my friends, well wishers and people who have helped me. I thank my family and friends for being there whenever I needed them. Team Kreyon is a group of mavericks’ working day and night on their dreams. I thank all the team members at Kreyon for their support and encouragement. You guys are simply awesome. I know the list is getting too long, but this is the last one. I would never have done anything worthwhile without my first love who happens to be my mother and my maternal uncle, Abhilash Dixit, an entrepreneur and a great human being whose wisdom I cherish.